Get in touch with Mother Nature in this blissful rainforest trek! Feeling a little jaded? Need a change of scene? 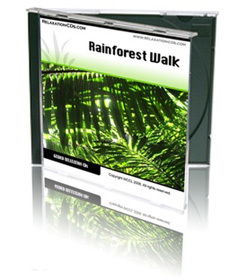 Then put this CD on your computer or music player, and let it transport you on a magical journey deep into the tropical rainforest. With the help of our guided visualization, you’ll imagine yourself on a walk through the forest. It’s a beautiful, peaceful place. Alongside you, giant tree ferns sway in the lightest of tropical breezes. Birds sing, and huge, exotic flowers open their petals, filling the air with heady perfumes. And when you finally return to civilization, you’ll feel relaxed and invigorated, ready to face any challenge – secure in the knowledge that any time you choose, you can return to the rainforest and enjoy this wonderful walk, time and time again!